Thick winter coats or snowsuits can keep your baby warm but they can compromise your child's car seat safety. In order for a baby car seat or toddler booster seat to function properly, the straps need to remain tight against the child's chest. 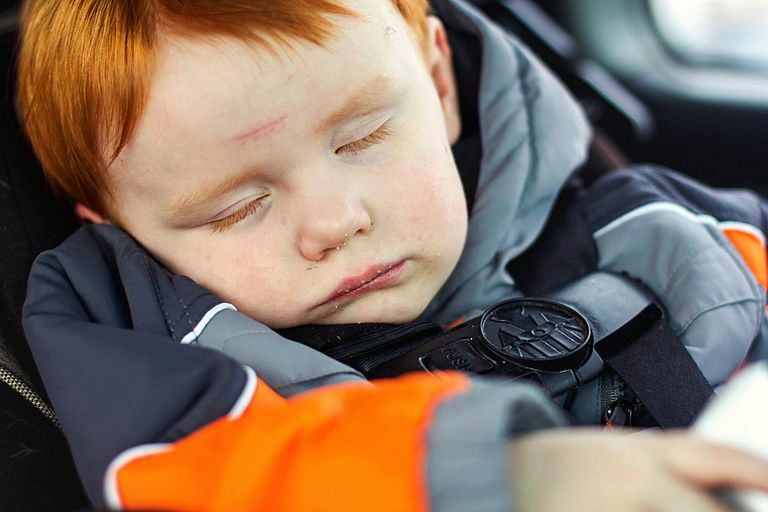 Winter coats and snowsuits change the way a child fits into the car seat. When the car seat straps don't fit the child properly, there is a chance the child could be ejected from the car seat. The car seat harness needs to stay close to the child's body at all times. All coats and clothing will compress in a crash, but thicker winter coats and snowsuits could compress enough to create a lot of slack in the harness. The effect could be as though you never tightened the harness straps at all. Those loose straps may not be able to keep baby in the car seat, or in the car at all. Even if you can't safely use your child's winter coat in the car seat, there are ways to keep baby warm when temperatures drop. Dressing in layers: Dress your baby or toddler in thin layers of clothing. Each layer holds in warm air. The layer next to the skin should be close-fitting, such as tights, leggings, long underwear, or a long-sleeved body suit. Cover this with pants and a shirt or sweater. Polar fleece jackets and snowsuits are warm but thin, making them a smart choice for a top layer. Dress your child in a hat, mittens, and warm socks or booties to keep head, hands, and feet warm. These won't interfere with the snugness of the straps. Take off any coat before buckling the car seat: If your child is wearing a coat when you put her in the car, take it off. Once buckled into the car seat, you can put the child's coat on backward over her arms to keep her warm without compromising safety. Add a blanket on top: Buckle the child into the infant seat, then cover her with a light blanket tucked around the sides. If needed, you can add another heavier blanket over the top of the infant seat. As the car heats up, you can remove a blanket so your child doesn't overheat. Make sure nothing is behind the child's back. No portion of the blanket, jacket, or car seat cover should be behind your child's back. Adjust the straps each time: You should only be able to get one finger under the harness at your child's shoulder bone. If you can pinch the strap, it is too loose. Warming up before you go: If you can, keep the carrier portion of your infant seat indoors so it isn't cold when you put your child into it. Warm up your car before putting the baby in the vehicle. This test can show you that a coat or snowsuit might compress too much in a crash and why it is safer to use thin layers and a blanket over the car seat instead. If you can fit more than two fingers under the harness at the child's shoulder bone, the coat is too thick and is not safe for use with the car seat. Many companies offer thick car seat covers that act like a bunting for babies in the winter. Parents should avoid buying any car seat cover or car seat bunting that threads through the harness straps of their child's car seat. Often the packaging of these covers states that the product meets all federal car seat safety guidelines. However, there are no federal guidelines governing after-market accessories. These extra car seat covers and buntings could interfere with the function of the car seat harness, and many car seat manufacturers will void your car seat warranty if after-market accessories are used. Winter car seat covers that fit over the top of the car seat like a shower cap or drape can usually be used safely. These should not have a layer under the child. Be sure the child's face is not covered. In order to become a certified CPS tech, Jen Ellis, a mother and certified Child Passenger Safety Technician from Meridian, Idaho, had to take an extensive car seat safety course and pass both a written exam and hands-on car seat installation exams. "When I took my tech class we were shown a picture of an infant seat with a snowsuit under the harness," she says. "The seat was pulled out of a car that had just been in a crash. The infant was ejected from the seat and the car and was found some feet away from the car, but the snowsuit was left in the seat just as the baby was wearing it." Ellis says other parents can learn a valuable car seat safety lesson from this real-life crash story. "It's a great example of what can happen in a crash if the straps are not tight enough and if a thick blanket or coat is under the harness," she says. "The harness must stay close to the child's body at all times." Winter Car Seat Safety Tips From the AAP. American Academy of Pediatrics. https://www.healthychildren.org/English/safety-prevention/on-the-go/Pages/Winter-Car-Seat-Safety-Tips.aspx. Why the Rush to Get Your Kids out of Their Booster Seats? Has Your Baby's Car Seat Been Recalled for Safety Issues? Do You Understand the Latest Car Seat Guidelines? What Does Your State Require for Car Seats? How Long Should You Keep Your Toddler in a Rear-Facing Car Seat?